It really sounds to me like there is a campaign on, pushing this new technology down the consumers throat. Like if I don’t use an infrared grill, I can’t make a good steak. Yeah, right! 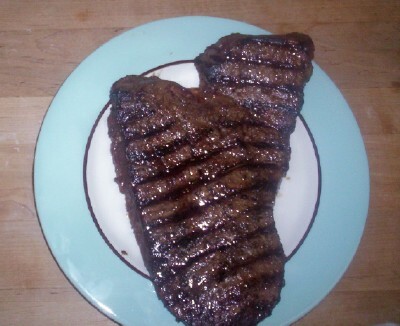 As you can see, there are perfect grill marks, the outside is seared just as it should be and the entire steak is screaming flavor. I let this beast rest for about 10 minutes and then I sliced it up. It was dripping wet and a perfect medium rare. Now don’t get me wrong, you will have an easier time in a steakhouse getting this result, but doing it on your own grill is simple. Just spice up your steak as you always do, and then just drizzle some olive oil on each side. Preheat your grill so it is as hot as it can get, and slap the steak right on to the hottest part of the grill. The steak should be at the least, an inch thick. Don’t touch it for 4-5 minutes. Flip it (once) with tongs or a spatula. Do not use a fork! The oil will create a quick flare up, but it will subside in a few seconds and it will get the oil on the meat sizzling. Now you don’t want a charred steak so if the flare up continues, you will probably have no choice but to move it. Next time, use less olive oil. The idea of actually using the flare up is to instantly get that oil working. The grill temperature is less than a steakhouse broiler/grill. The oil will catch the heat quickly and begin doing its thing. Sorry, but all these articles out there telling me my grill can’t do what they do in a steakhouse is not going to force me into buying an expensive piece of technology that in the end is not necessary for great grilling.